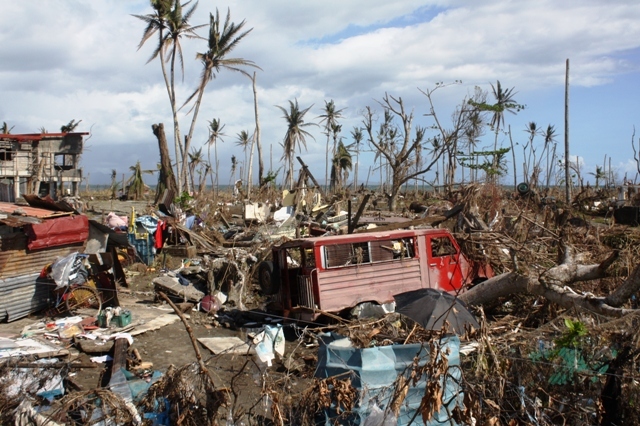 Typhoon survivors in the Guiuan area will celebrate an uncertain Christmas as aid workers and authorities struggle to provide shelter and livelihood assistance more than one month after Typhoon Haiyan made first landfall here, in Guiuan Eastern Samar Province in the Philippines. “We depend on relief goods for our daily needs. If there are no more relief goods, I don’t know what will happen to us,” said Virgilio Cerdo, 86, one of Guiuan’s estimated 47,000 residents. Cerdo used to make about US$2 a day tending a coconut farm, a major source of livelihood in the region.“I don’t know how to do anything else,” said Cerdo, looking at the uprooted coconut trees. Typhoon Haiyan descended on the central Philippines on 8 November with wind speeds of 235km/h and gusts of 275km/h, flattening everything on its way across large swaths of nine provinces. More than one million homes were damaged or destroyed, displacing more than four million people and leaving over 6,000 dead. The National Disaster Risk Reduction Management Council has put the damage to infrastructure at more than $412 million, while agricultural damage stands at $413 million. Many small businesses were destroyed or have been unable to continue operating, and most people now have no reliable source of income. Oxfam, one of 20 partners working in the area of early recovery and livelihoods, is looking into ways to help families recover faster.“We’re listening to both men and women from the families to see what skills they have, and possibly giving them livelihood opportunities. We often see that the women bring diversity in the ways the family gains a sustainable income,”said Justin Morgan, Oxfam country director in Manila, the Philippine capital. “The most urgent need right now is shelter,” said Andrew Lind, International Organization for Migration (IOM) programme managerand focal point for the 20 partners for shelter and camp coordination management (CCM) in Guiuan, adding that about 90 percent of the homes were destroyed. The International Committee of the Red Cross (ICRC) is exploring a “debris-to-shelter” building strategy. In a long-term shelter response that will run from January until October in 2014, they will be constructing permanent homes in 11 of the most affected municipalities of Samar and Eastern Samar provinces. "We will build these structures using lumber from coconut trees, hard wood and iron sheets, and respecting good construction principles to ensure 'storm-resilient' houses for 6,000 families who have lost their homes to Haiyan," said Marco Albertini, ICRC's water and habitat coordinator. Among the many challenges faced by aid agencies trying to provide shelter is an acute shortage of building materials, in particular corrugated galvanised iron (CGI) sheeting, commonly used for roofing in rural Philippines. On 18 December, the National Economic and Development Authority announced it would need more than $8 billion in investment over the next four years, with more than half going to shelter and the resettlement of people who were displaced. The schools reopen in mid-January, and the rainy season usually starts at the end of January and lasts until the end of February in some areas, intensifying the urgent need for short- and medium-term shelter solutions. In accordance with the Philippine Water Code, an area stretching 40 metres from the average high-tide mark on the shoreline has been designated as a “no-build zone”. Guiuan consists mostly of coastal communities and implementing this restriction will leave many residents with little choice but to relocate. Building the bunkhouses and relocating the residents will take time, and many say they are not prepared to wait. “We used to have a small plot of land where we could plant vegetables for us to get by. Our home, our crops, were washed away by Yolanda [the local name for Haiyan], now we have nothing,” said 54-year-old Lydia Adja. 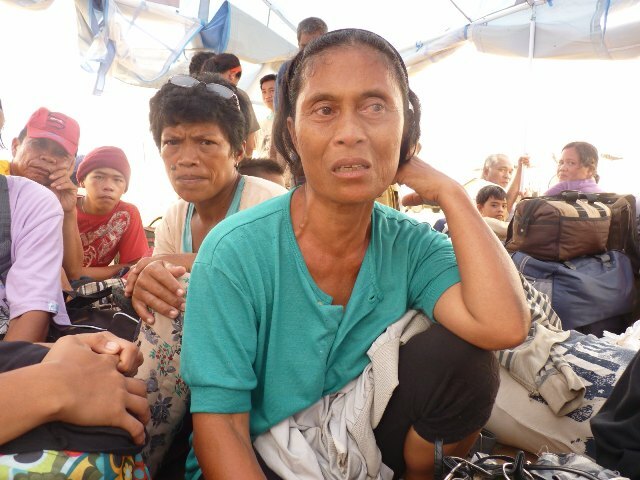 Like dozens of others, she has been camping for days at the Guiuan airstrip in the hope of getting a free flight to Manila on the return journey of a military cargo plane delivering relief goods to the area. But with more roads being opened up and foreign civilian military assets now completing their missions and leaving the Philippines, flights have become less frequent and more irregular.